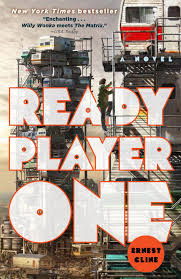 Currently reading Ready Player One by Ernest Cline (2011) published by Arrow Books, United Kingdom. It makes me want to go play Skyrim. I may be some time. Ok, I finished it. It had some interesting points in the type of society it portrayed and the narrator of the first person perspective is relatable, as a male who could do more exercise. Apparently it's now going to be a movie, which is neat. The Boy on the Bridge. By M R Carey. Walkaway A Novel by Cory Doctorow.